Seattle Seahawks player Michael Bennett remained seated during the playing of the U.S. national anthem before a pre-season National Football League game to protest deadly violence at a white supremacist rally in Virginia over the weekend, his team said. With his gesture on Sunday, the 31-year-old defensive end became the latest NFL player to use the playing of the Star Spangled Banner anthem as a protest forum. Last season, San Francisco 49ers quarterback Colin Kaepernick grabbed the media spotlight when he refused to stand for the anthem, saying he was protesting police brutality and social inequality. Kaepernick opted out of his contract in March and has not been signed by another team. Bennett remained on the bench with a towel over his head before Sunday's game with the Los Angeles Chargers at Southern California's StubHub Stadium, the pre-season opener for both teams. He said he would keep up the protest all season. "With everything that's been going on the last couple of months, and especially after the last couple of days seeing what's going on in Virginia, and earlier today in Seattle, I just wanted to be able to use my platform to be able to continuously speak on injustice," Bennett said in a story on the Seahawks' website. In Charlottesville, Virginia, on Saturday, a woman was killed and 19 hurt when a car plowed into counter-protesters near a white nationalist rally. James Fields, 20, who had Nazi sympathies as a teenager, according to acquaintances, has been charged with second-degree murder in the incident. The violence sparked protests and vigils in cities across the United States on Sunday, including Seattle, where clashes occurred between supporters and opponents of President Donald Trump. The president raised a furor when he initially failed to explicitly single out the white supremacists widely seen as sparking the melee, saying "many sides" were involved, although he was more explicit in his criticism in a statement on Monday. 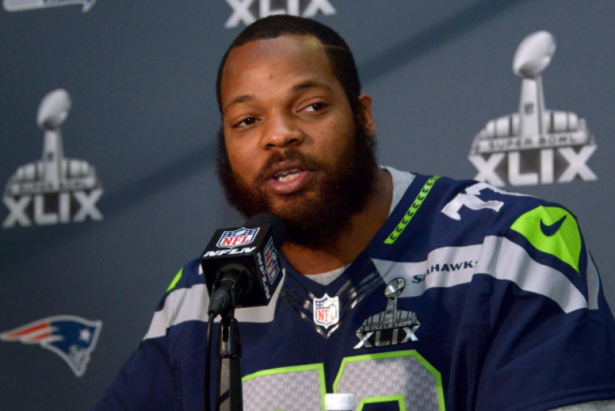 Bennett said he was not anti-military or anti-American but opposed intolerance and injustice. He said he expected to face criticism over his decision, adding, "This is bigger than football." A spokesman for the team did not respond to a request for comment. On Saturday, Oakland Raiders running back Marshawn Lynch also sat during the national anthem before a game against the Arizona Cardinals. But Oakland's head coach, Jack del Rio, quoted Lynch at a postgame news conference as saying sitting out the anthem had no significance in his case and was simply something he had done for the past 11 years.